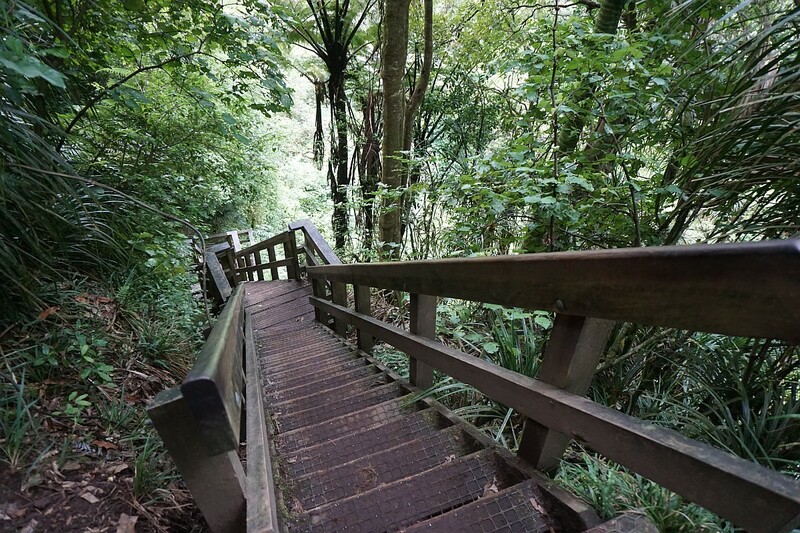 There are two alternative tracks from the carpark on Goodwin Road to the top of the Wairere Falls, In the Kaimai-Mamaku Forest Park, east of Matamata. The main track passes by the lower falls lookout on the way to the top. 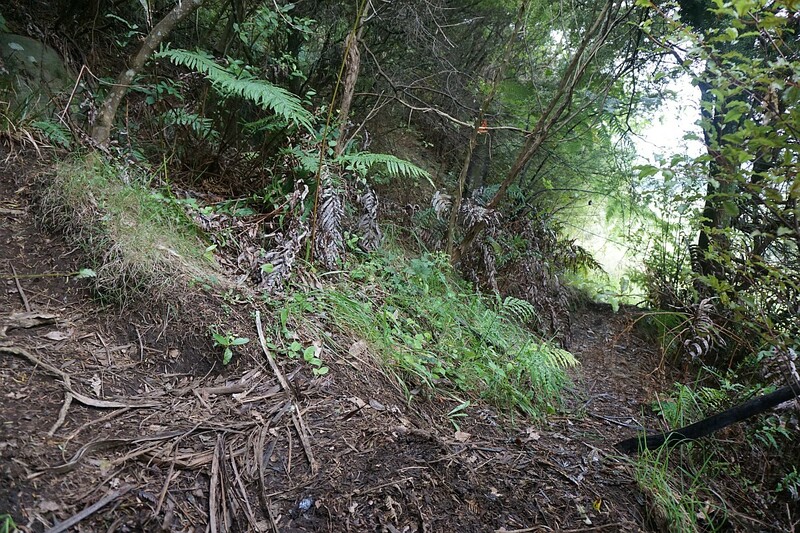 The alternative route, which is only signposted where it joins up with the main track near the top of the falls, is signposted as “Ancient Maori Trail (Very Steep and Not Maintained)”. The sign is not wrong. The track is steep and not very well marked, although there are occasional orange triangular DoC markers to show the way. Otherwise it is more or less necessary to follow a visual trail showing previous use. The lower junction with the main track is unfortunately not signposted, and can be difficult to locate. 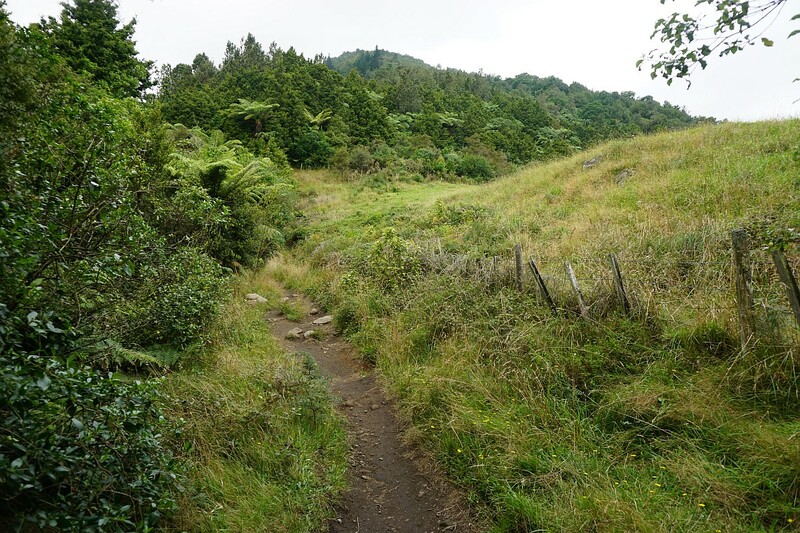 Since the track is steep, rough, and slippery in places it is easier to walk uphill than downhill.For this walk the Ancient Maori Trail was walked in the uphill direction, with the longer main track used for the return. 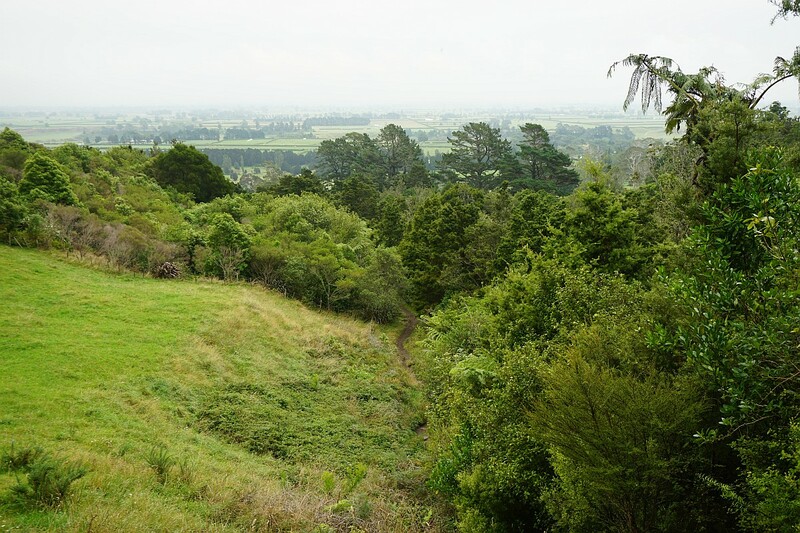 Although the Ancient Maori Trail is shorter than the main track the times for the two options are similar. 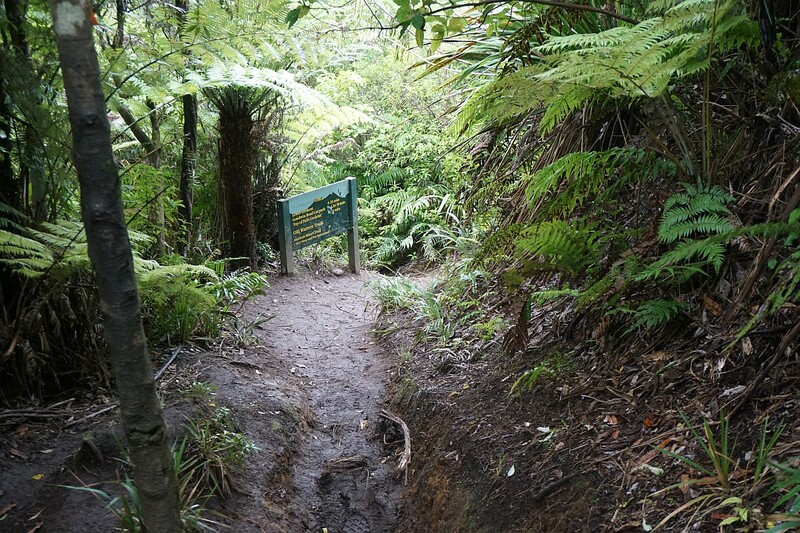 The Maori Trail climbs about 245m in elevation for a horizontal walking distance of about 580m, according to the GPS. 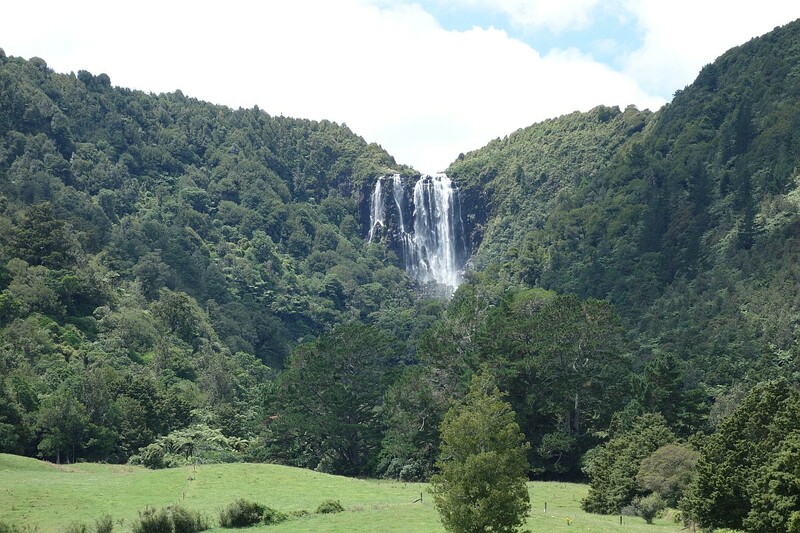 The DoC web site page for Wairere Falls does not mention the Ancient Maori Trail. The main track is described on that page, as well as on a previous entry on this blog. 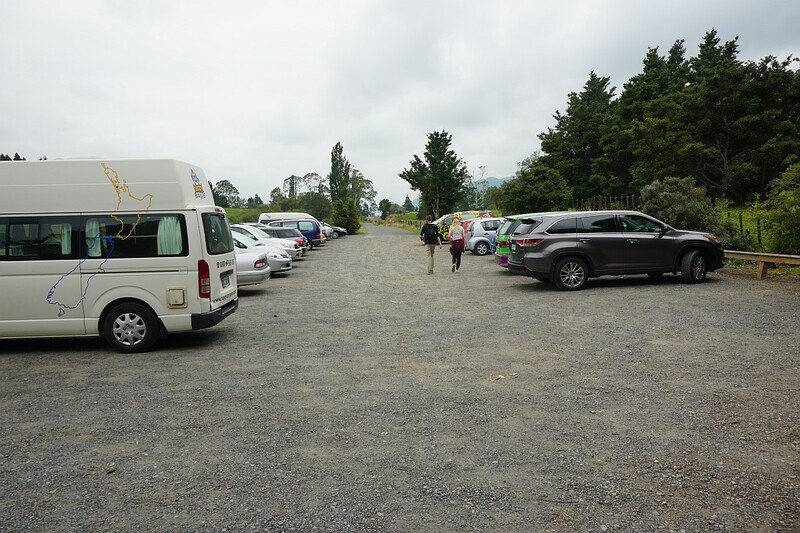 There is a parking area at the end of Goodwin Rd, off Old Te Aroha Rd, with basic toilet facilities near the start of the track. Dogs are not allowed on the tracks, according to the DoC web site. 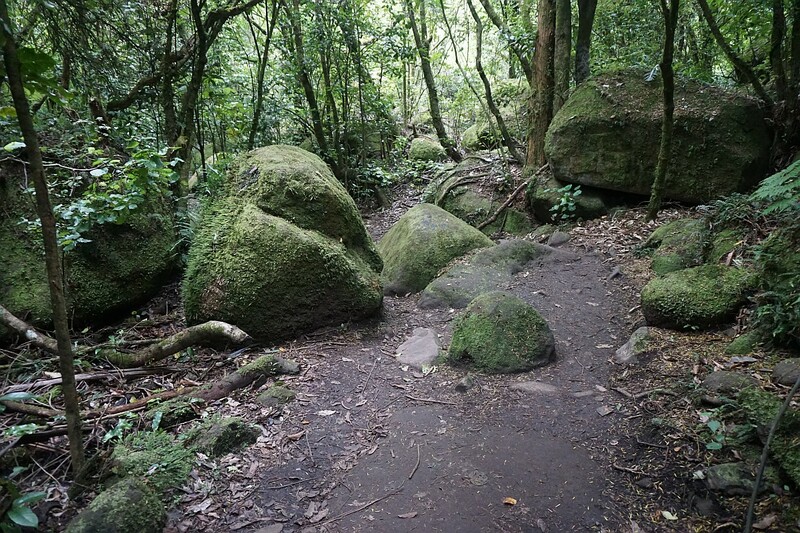 The lower part of the track passes through easy terrain with a number of large boulders. 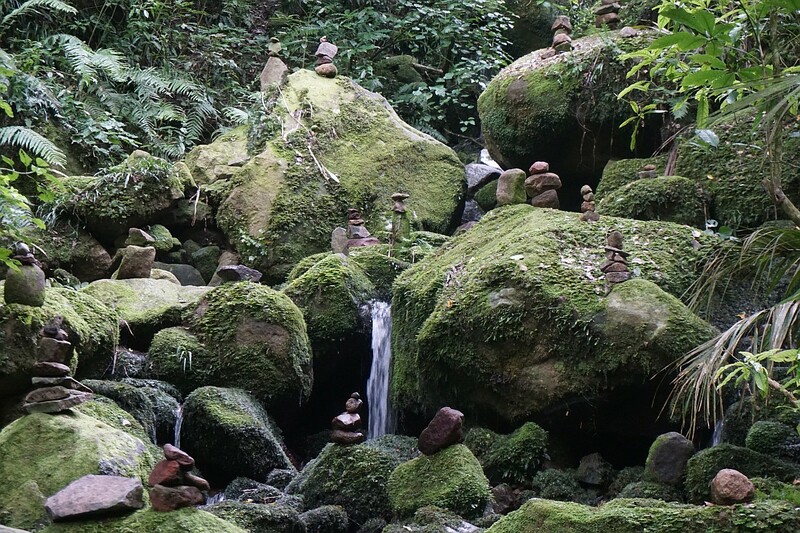 Many of them covered with moss. There is a bridge across the Wairere Stream. Shortly after crossing the bridge the track runs alongside a fence, with farmland on the other side of the fence. 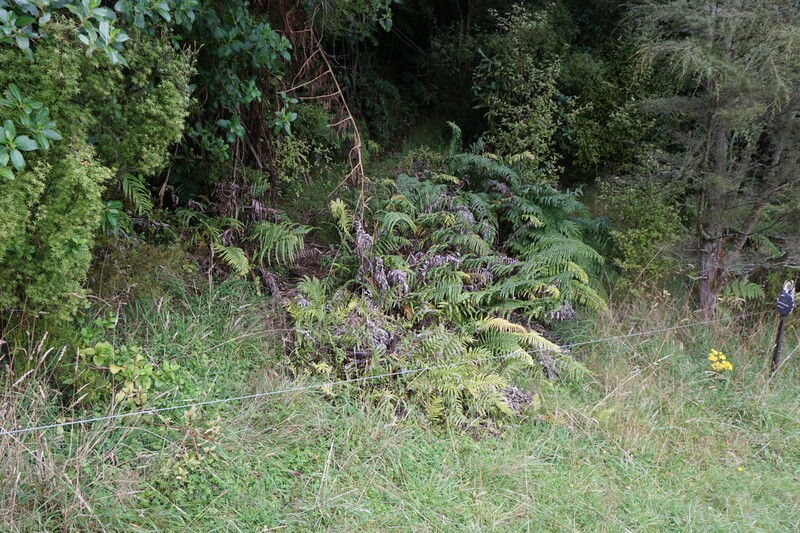 The Ancient Maori Trail follows the fence that can be seen at the bush boundary. 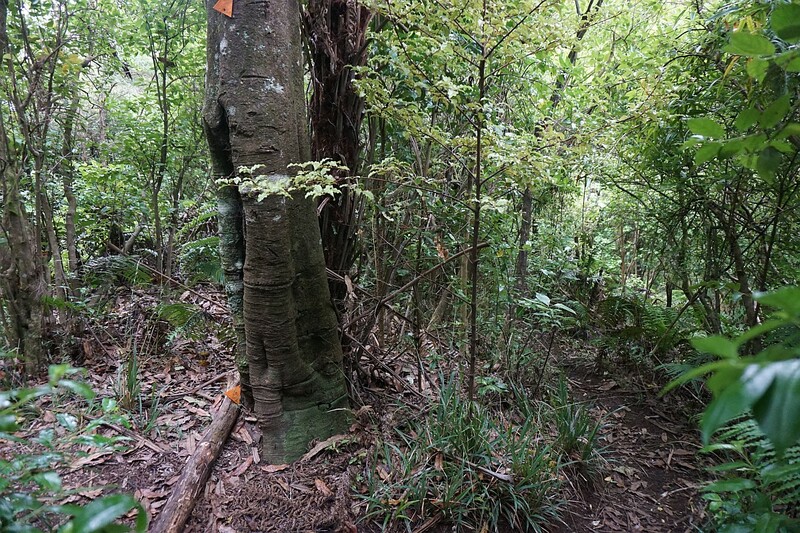 Shortly after reentering the regenerating native bush there is a very small clearing, with the Ancient Maori Trail branching off to the right. The main track continues straight ahead. 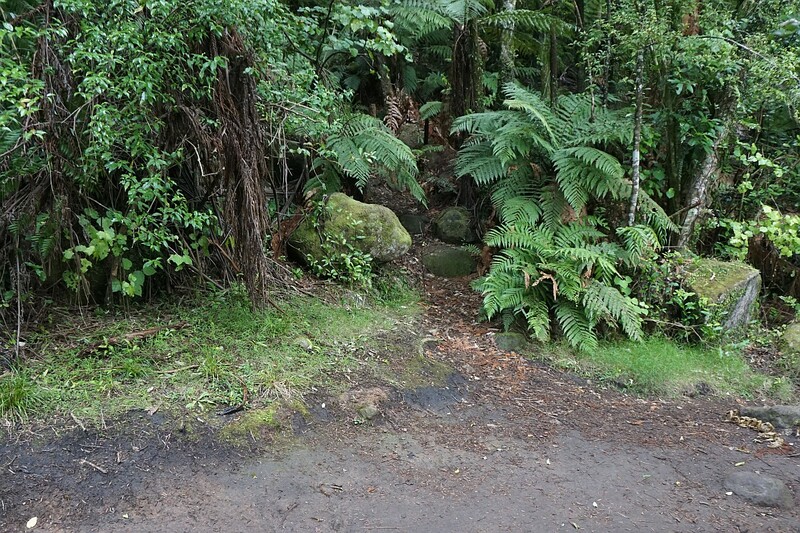 The starting point for the Ancient Maori Trail. 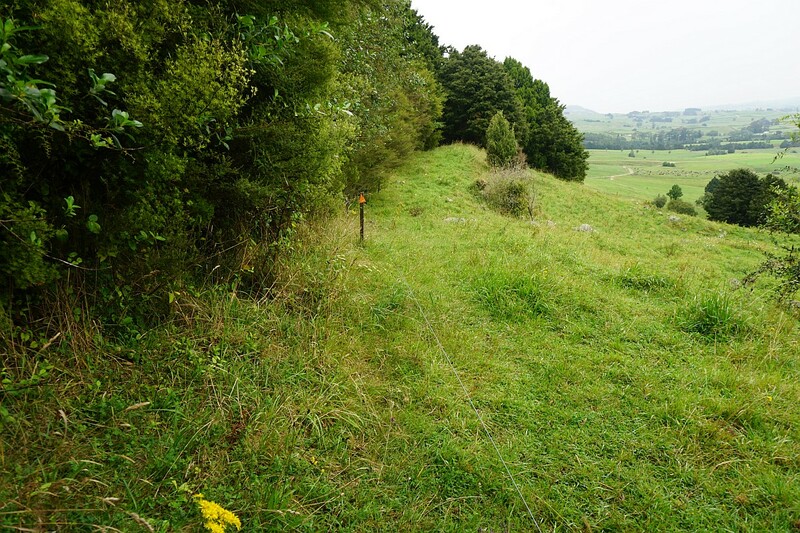 Looking back to the main track, at the right-hand edge of the grassed area, from the fenceline at the bush boundary. The trail follows the fence for a short distance. At the end of the fence there are two options. The well-hidden orange marker on the post just right of centre points straight ahead, presumably to the official track, but it seems that most follow an old fence branching off to the left. The two options join some distance up the hill. 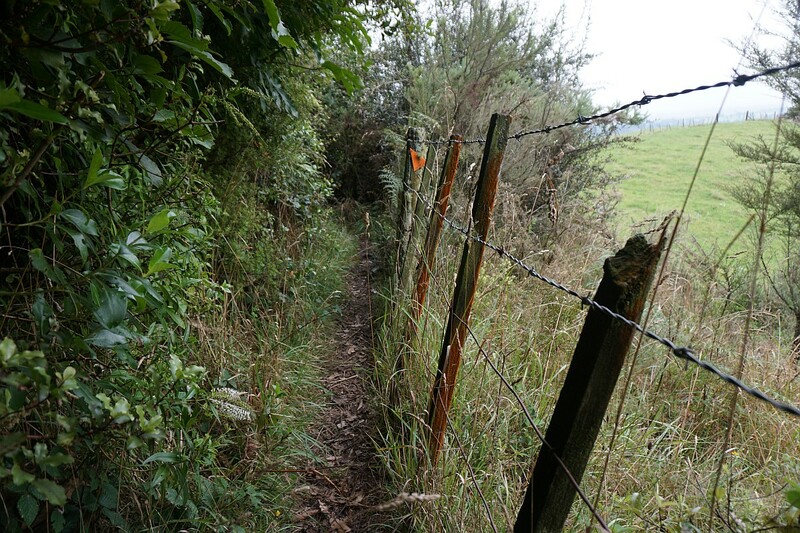 A single fence wire has to be crossed in the clearing to the right. After crossing the fence wire there is an electric fence wire on the right. This has to be followed for about 10 to 15 metres, before the track takes a left turn into the bush. 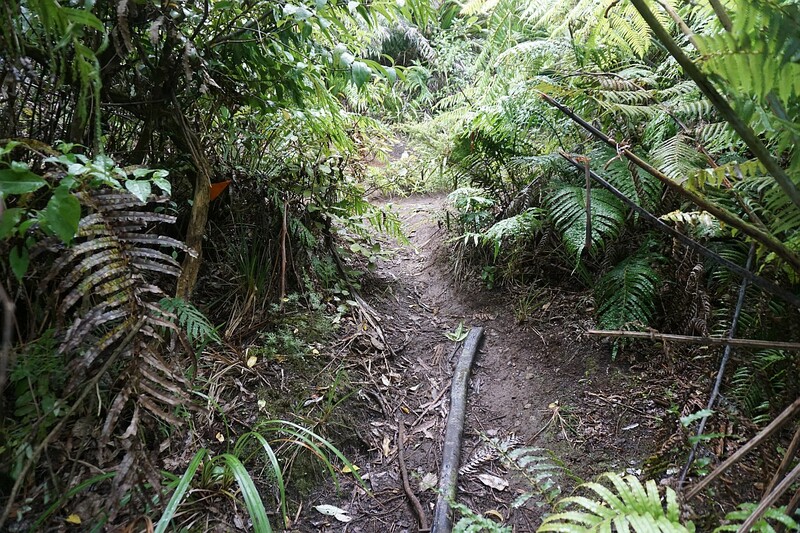 The track into the bush is not marked, and is not immediately obvious. And apparently not used very often. The fenceline track and the ‘official’ track rejoin at the upper end of the fence. Looking back down the two tracks, the orange marker at the top of the photo can be turned to show either the fenceline track to the right, or the ‘official’ track to the left. Judging by the marks in the bark of the tree it originally pointed to the ‘official’ track on the left, but the one to the right is obviously used more often. 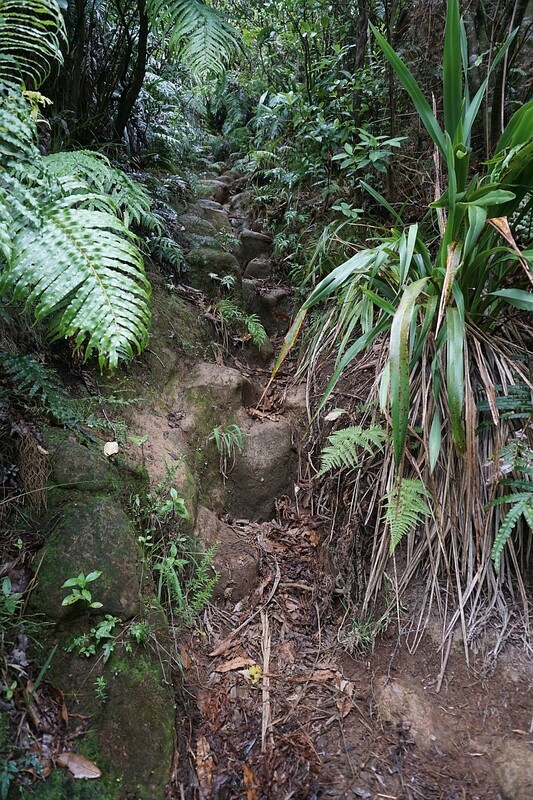 The trail has an almost constant steep gradient, with parts being washed out to a deep rut, and parts being natural steps formed by rocks. 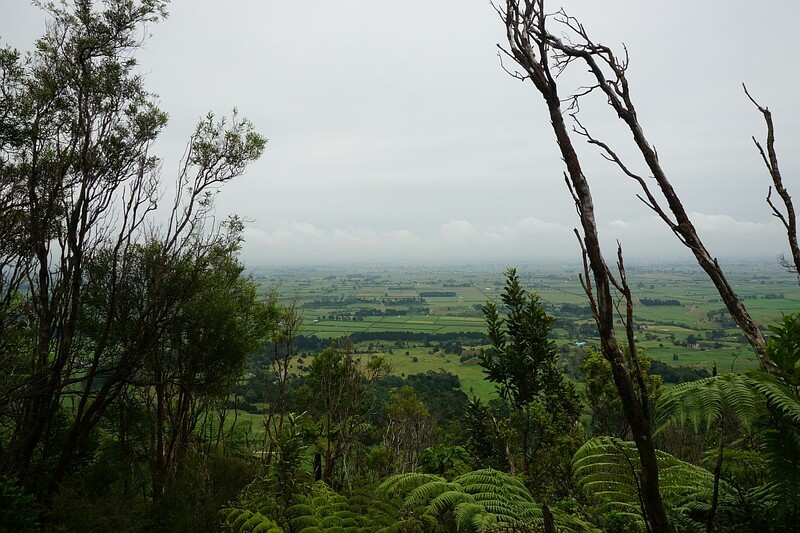 At various points during the climb there are views through the vegetation over the eastern Waikato towards Matamata, Waharoa, and further north. 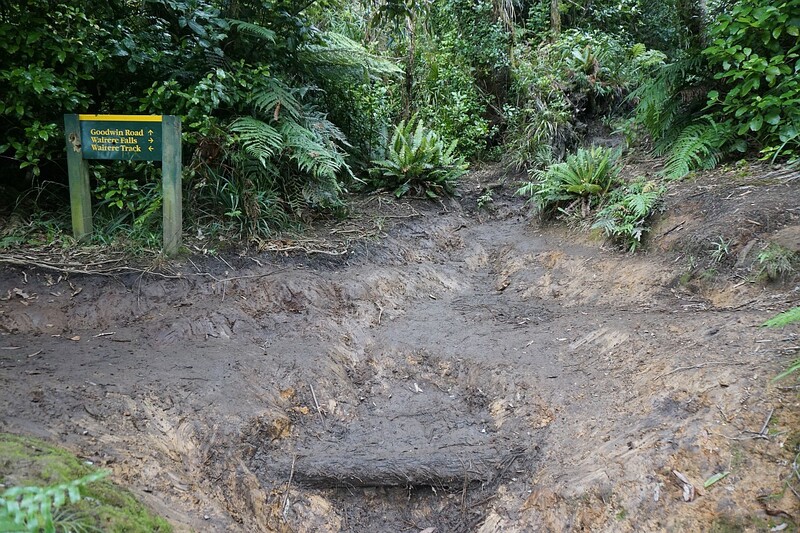 The Ancient Maori Trail where it joins up with the main track again. 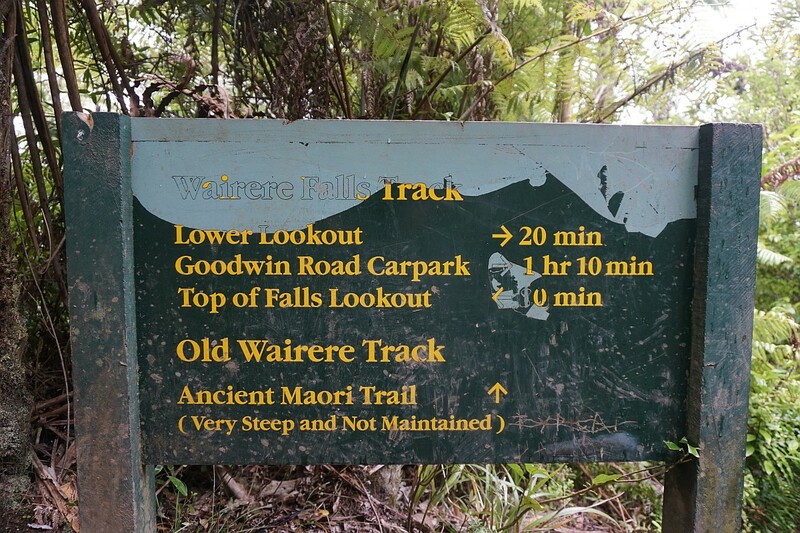 The sign at the upper junction of the main track and the Ancient Maori Trail. Looking back down the track, the main track continues around to the right, with the Ancient Maori Trail branching off to the left behind the sign. 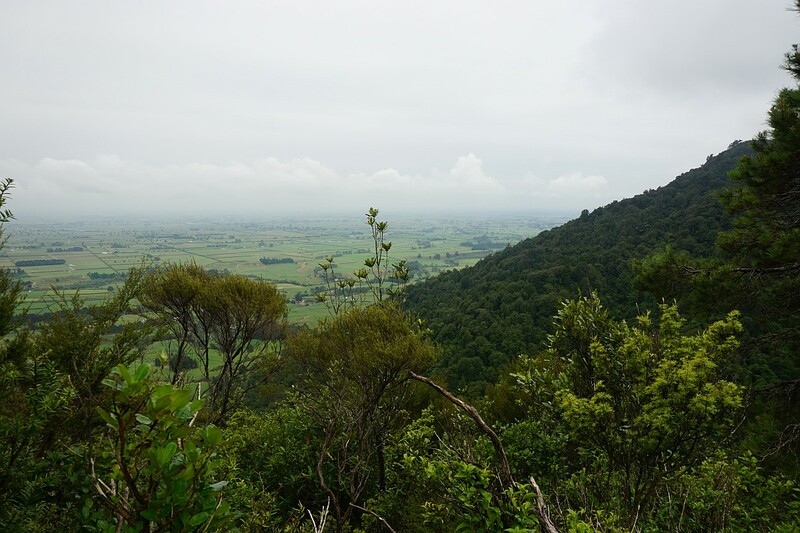 The Wairere Track continues on to the North-South track through the Kaimai Range. The track back to Goodwin Rd continues up to the top right. 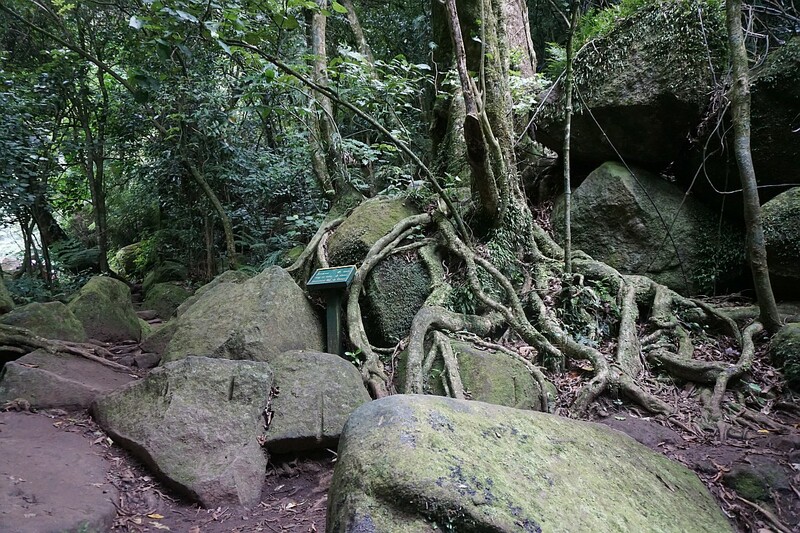 The track to the waterfall viewing platform is at the very bottom of the photo. 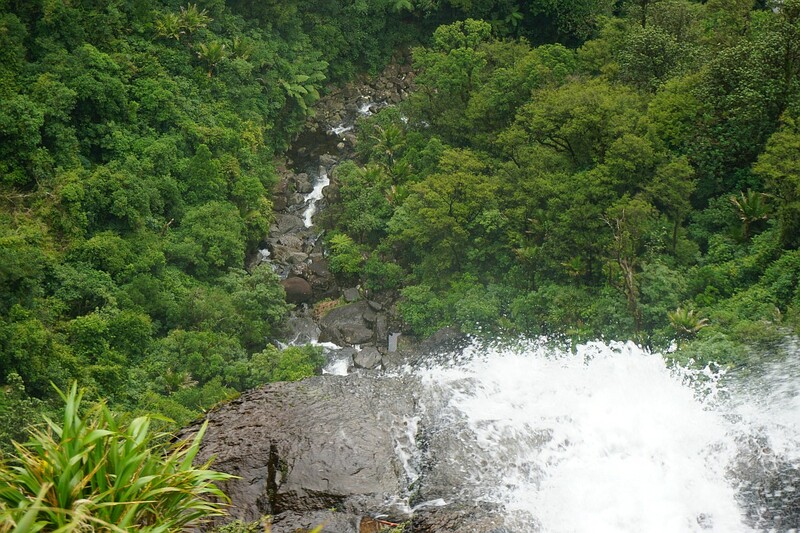 The lookout at the top of the falls, with a drop of about 153m to the rocks at the base of the second drop. A young guy has ventured out onto a boulder at the very edge of the falls. Definitely not recommended. 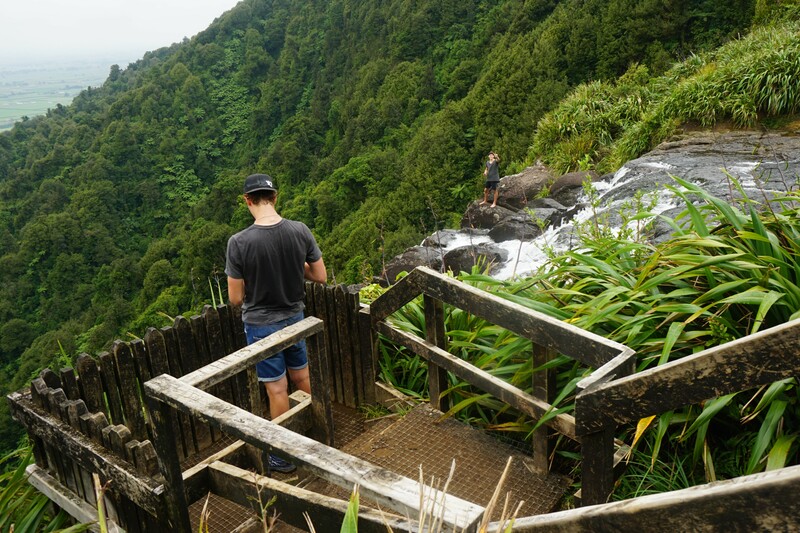 Looking from the lookout platform to the stream over 150m below. The lower viewing platform is no longer clearly visible from here, being hidden by vegetation. Returning by the main track, coming from the right, the sign to the lower lookout is easy to miss. The falls, in two main steps, totaling about 153m in height, seen from the lower viewing platform. Wooden steps have been built for the steepest part of the main track back to Goodwin Rd. The Wairere Stream is crossed 3 times. All on well-built bridges. The stream seen from one of the bridges. 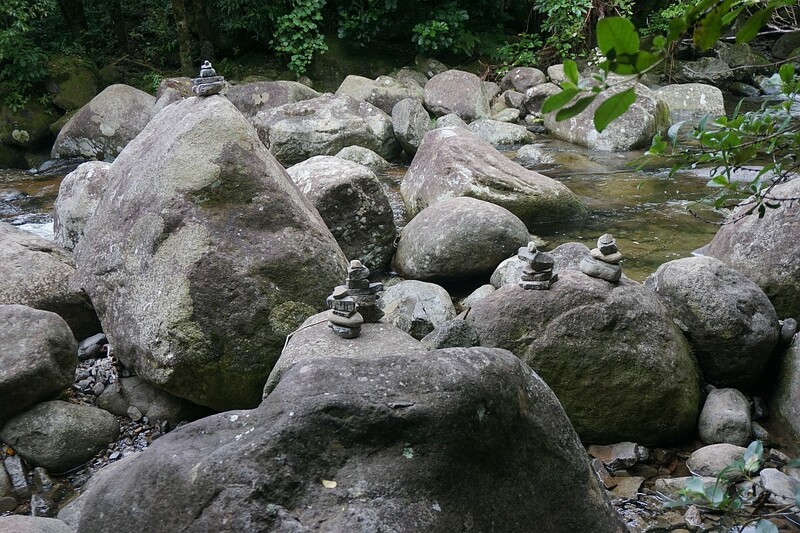 Small pyramids, built from loose stones, can be found in various places on rocks alongside the track. Wairere Falls seen from the carpark on Goodwin Rd. 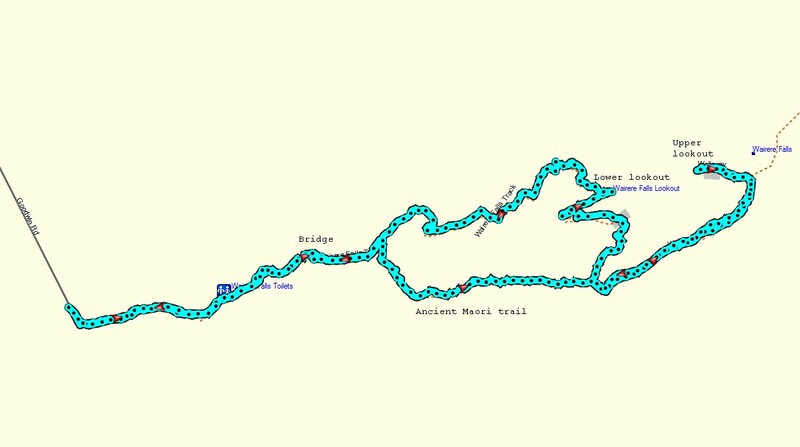 The GPS tracklog shows the tracks followed, with the Ancient Maori Trail and the lookouts being marked. Carpark to top of falls: 2.2 km, 1 h 25 min. Top of falls to carpark: 2.9 km, 1 h 15 min. Lower lookout to carpark: 1.7 km, 45 min. 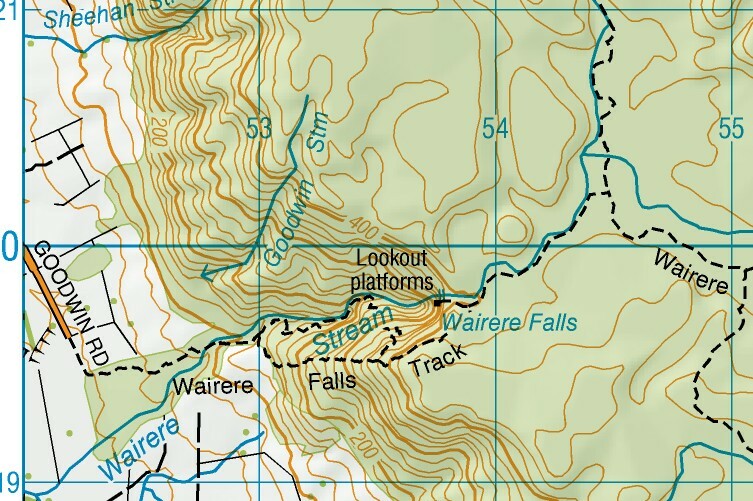 The topographic map shows the tracks and the contours, and the location of the falls. 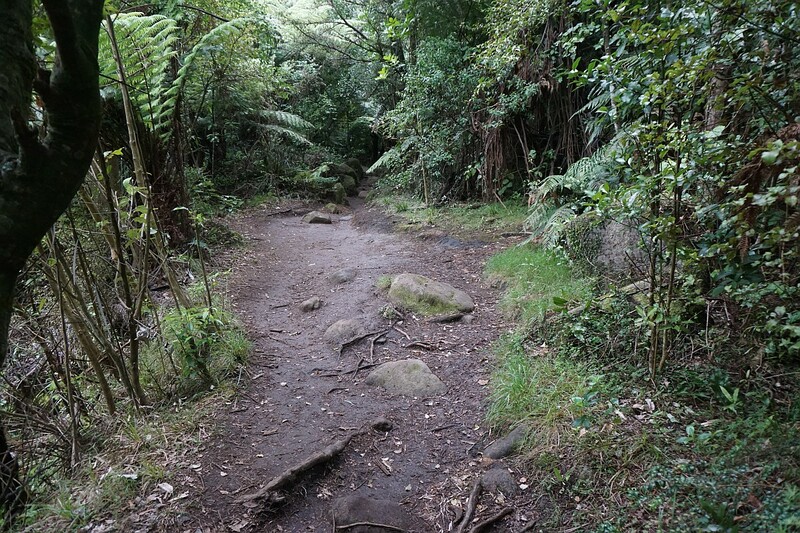 The Ancient Maori Trail was walked on February 9, 2016, and the main track on February 7 and February 9, as well as on several previous occasions. 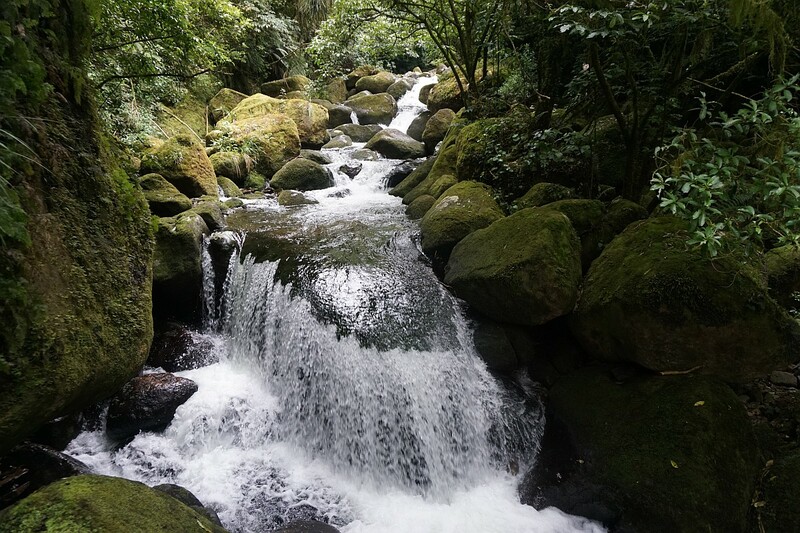 This entry was posted in Walks and tagged Matamata, Wairere Falls on 2016-02-10 by nzartig. 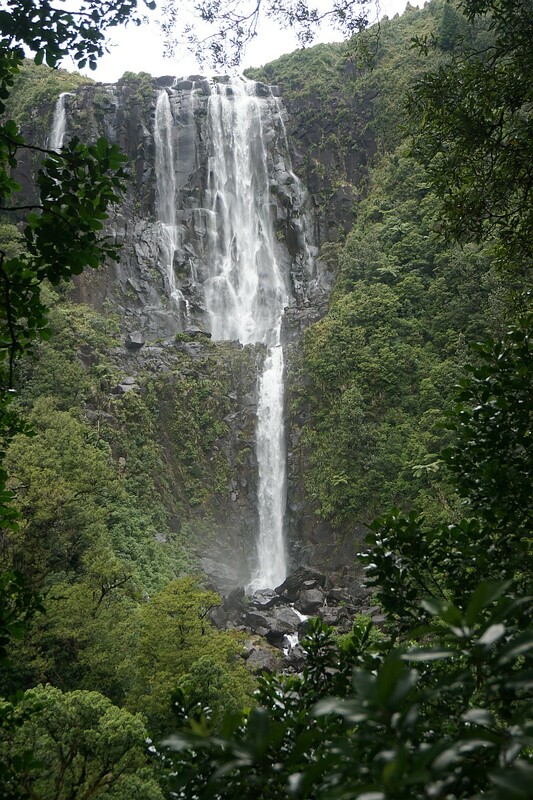 Pingback: Wairere Falls Track: Hike to the highest waterfall in NZ North Island!